It took three neighbors, a sheriff's deputy, a metal pry bar and several gun shots to help rescue a man from a brutal pit bull attack in the South Hill neighborhood of Puyallup this week, according to the Pierce County Sheriff's Deputy. The incident took place Wednesday evening in the 15500 block of 119th Avenue Court East. A Pierce County sheriff's deputy arrived to find a 28-year-old man covered in blood being helped by three men — with the pit bull still clenched on the man's leg. One man was holding a T-shirt against a wound on the man's leg; another was pulling on the dog's legs; another used a pry bar at one point to try to get the dog's jaw off the man. Finally, one man managed to throw the pit bull away. It began circling the group, reports say. The Pierce County sheriff's deputy fired his gun several times at the pit bull, wounding the dog. It survived and is being treated at the Tacoma-Pierce County Humane Society. The victim was taken to the hospital with serious injuries to the face, arms and legs. According to a woman who witnessed the attack, it began when she was giving the victim a ride. The pit bull and another dog were in the back seat of the vehicle. The woman and the man were "playfully arguing" about music, she said, when the pit bull lunged and bit the man's face. The woman said she stopped the car and the man ran. The pit bull chased him down and took him to the ground. She said she got the pit bull back into the car, but it jumped back out of the window and attacked the man again. The man who used a pry bar to help suffered puncture wounds on his hands. The pit bull belonged to one of the victim's friends. Authorities are unsure why the dog was with the victim and the woman and not the owner. 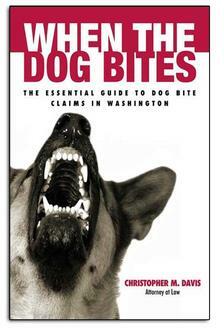 Luckily, Washington state has a dog bite statute that is favorable to victims. The law makes the owner of the dog strictly liable for dog bites. Additionally, anyone who harbors, keeps or is negligent with a dog can be held liable for injuries caused by the dog. Even with Washington's dog bite laws favoring victims, it is not always easy to pursue compensation. In many cases, a dog owner's homeowner's insurance policy will cover dog bite liability — but then offer low-ball settlement amounts in an effort to pay the smallest amount possible. Their goal is to close the claim as quickly as possible. RELATED: I Was Bitten By A Dog...What Should I Do? RELATED: How Does Insurance Work In Dog Bite Injury Claims? At Davis Law Group, people often ask us what happens after a dog bite case is settled. It is important to recognize that there is not such thing as a minimum or maximum compensation for dog bite injuries. Every case is different, and individual recovery depends on the particular circumstances of your case. $975,000 wrongful death settlement for the family of a man killed by a dog bite. $500,000 injury settlement for a woman who suffered serious facial injuries from a pit bull attack. $435,000 jury verdict for a victim of a pit bull attack in Hoquiam. $300,000 settlement for the victim of a pit bull attack. $250,000 settlement for a woman who was attacked by a pit bull that jumped through a homeowner's fence. Davis Law Group is currently representing UPS driver Kevin Backlund, who was attacked by four pit bulls while delivering a package Puyallup in September. Having the right attorney on your side can make all the difference. Attorney Chris Davis of the Seattle-based Davis Law Group, P.S., is considered the premiere dog bite lawyer in Washington state. Mr. Davis is armed with nearly 25 years of experience handling dog bite cases in the state and is familiar with various laws, ordinances and precedent-setting cases that will impact your negotiations. Dog bite victims are often left with life-changing injuries. Hospital bills and medical treatment, vaccinations, treatment of infections, and rehabilitations can get expensive fast. Combined with lost wages and pain and suffering, these attacks leave victims with a completely different outlook on life. Get your life back on track by contacting a Washington state dog bite attorney today. Call (206) 727-4000, use the chat feature below or fill out the form on this page to get started.